Parques Reunidos offers a wide array of services to park developers. We seek to advise our clients and partners on the design, development and construction phases of a park with the aim of signing a long-term management contract for the operation of the park. We are one of the few operators with the skills to run parks profitably, and the only one with a proven ability to operate all types of parks — attraction, water, animal and other attractions, branded and non-branded — across different regions and at high margins. We have thus acquired an international competitive advantage in the industry thanks to our ability to operate parks under any brand, whilst maintaining the local qualities and traditions of said parks. We provide credibility and offer investors and financial institutions great confidence that they will obtain the best possible return on their investments, by leveraging our expertise, recognition and prestige as a leading company in the leisure park industry. Given the fact that developing greenfield projects – like those we have in the Middle East and – has proven to be an increasing/growing trend, we believe that the management contracts model represents a growth opportunity for key/main/core assets. Management contracts represent a great growth opportunity that can be proven through our two most recent projects: Motiongate and Bollywood parks in Dubai. We also expect that other on-going discussions regarding a number of business opportunities will become effective in the upcoming years. Review of the schematic design of the park from an operational and safety perspective, including layout, list of attractions, services and parking, etc. The park will then be integrated into the Parques Reunidos operational structure, and will be managed by Parques Reunidos with the same levels of quality, reporting, efficiency and control as any other park in our portfolio. As such, the park will benefit from the Parques Reunidos Group’s purchasing power and business model, with access to the best practices of the Group in all areas and to the best prices in the market for its expenditure and investments. We achieve the highest margins in the industry worldwide, as proven by the results we obtain through the management of our current portfolio across all segments, regions and types of parks. 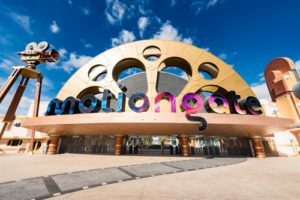 MOTIONGATE ™ Dubai occupies 1.9 million square feet in an area where it will be able to expand up to 4 million square feet. It will comprise four main areas, 27 rides (some of which will be multimedia), 3D simulators and 4D theatre, roller coasters, and a launch/drop tower, as well as rides for children. Due to local weather conditions, 21 of the 27 rides will be located in indoors, air-conditioned facilities. The park’s theme revolves around Hollywood’s most memorable film franchises: DreamWorks Animation Studios, Columbia Pictures Studios, and Lionsgate. The visit begins at Studio Central, a replica of the executive offices of a working movie studio, which are set in the golden age of Hollywood’s glamour and the birth of the silver screen. From Studio Central, visitors will access the four other areas of the park: Columbia Pictures Studios, Smurf Village, Dreamworks, and Lionsgate, where they will experience movies like Shrek, Madagascar, Kung Fu Panda, How to Train Your Dragon, Ghostbusters, or The Hunger Games. Through an array of rides and attractions, a large number of restaurant and retail, and a variety of shows and entertainment events inspired by Hollywood productions, MOTIONGATE™ Dubai hopes to appeal to audiences from the United Arab Emirates (UAE), but to tourists, families, young people, couples, and thrill seekers. Bollywood Parks™ Dubai is a first of its kind theme park showcasing the authentic Bollywood experience. Bollywood, the Hindi language film industry based in Mumbai, India is one of the largest centres of film production in the world. Opened in 2016 within the Dubai Parks and Resorts destination, Bollywood Parks™ Dubai covers 1.7 million square feet. Nine of its 16 attractions will be located indoors, in air-conditioned facilities. Located just before the Dubai-Abu Dhabi border in the United Arab Emirates, the park will feature cinematic rides, thrilling attractions and entertaining live shows that bring to life the action, music, dance and drama of Bollywood. Bollywood Parks™ Dubai will recreate the Bollywood experience through themed attractions and rides spread across five zones: Bollywood Boulevard, Mumbai Chowk, Rustic Ravine, Royal Plaza and Bollywood Film Studios. Visitors will experience bold action, colourful story-telling and captivating dance sequences inspired by nine popular films: Rock On! !, Don, Lagaan, Sholay, Dabangg, Mughal-e-Azam, Zindagi Na Milegi Dobara, RA.One and Krrish. 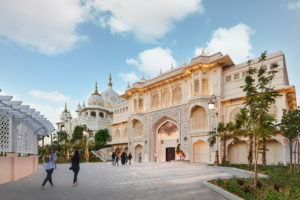 Bollywood Parks™ Dubai’s flagship offering is the 850-seater Rajmahal Theatre that will be home to a Broadway-style, Bollywood -themed musical. During the day, the park will have up to 20 live shows across six stages: Rock On! !, Crossroads, Mumbai Express, Rangmanch, Stars on Steps and Cinema Circle. The park will also offer six themed restaurants that capture India’s mouth-watering culinary offerings, and eight retail outlets stocking quintessential filmy fare. The Oceanogràfic of the City of Arts and Sciences of Valencia (Spain) is the largest aquarium in Europe and contains specimens from all of the world’s main marine ecosystems. Each of the buildings of the Oceanogràfic is dedicated to one of the following aquatic environments: the Mediterranean, the Wetlands, Temperate and Tropical Seas, Oceans, the Antarctic, the Arctic, Islands and the Red Sea. It also has a Dolphinarium with 24 million liters of water and a depth of 10.5 meters. The Oceanogràfic’s architecture and animal collection make it a world-class park. 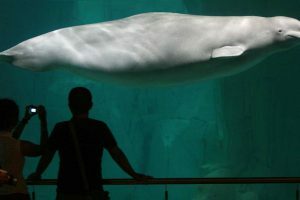 Parques Reunidos managed the Oceanogràfic successfully since its opening in 2003 until July 2015.